I'm starcraft.man on the Ubuntu forums, not much to say on it. I'm a man. I play starcraft. 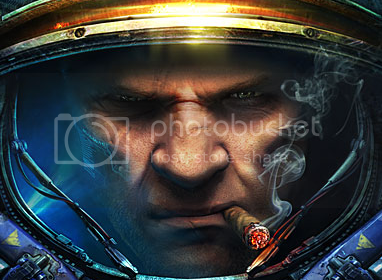 starcraft.man. Nothing deep or philosophic. I actually just created it from the first thing that popped into my head after my first few preferred usernames were taken. I bet that put your mind at ease. I live in Quebec, Canada and I speak English and French fluently. Currently going to university as a Computer Science student, full time this fall. A big obligation, but I'll still find time to be around to help where time permits, least a few hours a day as I can. I'm not a professionally trained IT person, mostly self taught up until this point. I have had over 10 years experience with Windows, actually started with DOS 6.0 and 95, but then was mostly gaming when I was young. Most of the knowledge came from fixing 98, 2k, XP and Vista. Got into Linux due to long term frustration with Windows, and refusal to be a Mac guy. I now live mostly happily ever after. Not much else to say, I've helped at the Ubuntuforums for quite a while and know plenty of folks. Only serious blip was a year+ of inactivity I had, unfortunate, but all is well now and even during heavy study I should be able to maintain suitable activity. As to hobbies, I've quite a few, apart from a bit of leisure writing and reading. My favourite is probably gardening, a relaxing hobby that I got introduced to by my father. Now have a fairly large patch of vegetables every year filled with tomatoes, cucumber, carrots, lettuce, and radish. On a related note, I'm a cook as well. Nothing fancy, not a big chef with personal recipes, just enough to cook nicer meals than what you buy packaged in a supermarket (though I suppose that isn't saying much considering). Not much of a sports person, though I do enjoy watching hockey during the winter and always root for the Habs (though I know they won't win the cup). Need to get back to being active. Sorry to folks who missed me, bit of a story. Note: I'm not a big email person, if you need to get to me quick, a PM on ubuntuforums is usually the fastest means or dropping into the IRC channel for beginners team. BASH - Enough to write competent scripts. Perl - Less fond lately, rather not write. Scrum Practitioner (I like it a lot). QT - For kde dev. Flash - On my list for job. As an experienced member of the Beginners Team, I've taken on a Padawan for integration and eventual membership in the beginners team. Current Padawans: omar-elmohandes, jamie - Are now with me for mentoring. Notes: He likes C++, lots of energy :). stlsaint - Moved to Bodhi_Zazen for more server oriented mentoring. Amicable parting, well I guess not really parting since we still in same team. valindil89 - Inactive, so setting away for now. Ubuntu Forums as starcraft.man . I try to focus on those threads with 0 replies in the main support categories and beginner section. Providing support also helps me learn more each day, usually by forcing me to research things just outside my knowledge. Installation Guide for Ubuntu Was frustrated explaining installation every time, so I created my own guide including the information I deemed essential. I hope some people found it useful over the years, I should update it though most holds true just the same. Updated Installation Guide During my absence, was moved and updated. Thanks forest. TestDisk Guide - Was in response to a user, I could probably turn it into a guide with a few pictures. A project for the future. Listed here only if significant contributions made. See page history and diff to see what I contributed. Note: Making people laugh is a contribution if ya ask me :). I'm currently working on a 4 year software engineering degree. I imagine that will take some of my time, but I will always be able to find time for the wiki and forums, I find it oddly relaxing though some would find it more work. In terms of contributing to Ubuntu, I will continue supporting people via the forums (when I can) as well as editing documentation on the main wiki pages. I was thinking of updating my wiki guide, but at this time I am thinking of deferring that to the future. As it stands, most of it is still pertinent and it seems other things need my attention. I'd like to think sometime into my degree when I'm a more experience programmer I'll start contributing to a project on lp as best I can, but I can't make any promises. Get more involved in the community in general, via loco in Quebec. Get involved with a programming project eventually. BodhiZazen - It is my pleasure to welcome starcraft.man back to the community. I have known starcraft for quite some time and found him wandering the VirtualBox forums one day [Long ago in a galaxy far far away ... ] =) . Starcraft is amazing and I think one of the few who writes how-to's longer then mine. Installation Guide for Ubuntu is a classic and many people have learned much from starcraft. Although he will never admit it, starcraft is an amazing teacher, both patient and willing to spend the time to give helpful and detailed answers. It is truly my pleasure to welcome him back from his vacation to real life and I fully support his membership both to the UBT and as an Ubuntu member. Silver Fox - I wasn't sure if I should write Starcraft.man a testimonial as it is likely he will be going for membership around the same time as me, especially since he had written me one. I have decided that I will do it anyway, as he really does deserve praise and it should not be stopped even if it looks like a case of "I'll rub your back, you rub mine". Starcraft.man is of a rare type that always seeks to help others whenever he can, no matter what the problem or how busy he is. He has a wealth of knowledge at his disposal that he demonstrates on a regular basis in #ubuntu-beginners-help. He also is active in other ways, noticeably through his contributions to the community wiki pages. He is more than just a screen name spouting out help to all comers, he is a person that I am glad to say has become a great friend of mine. I wish him all the best in his application for membership. Please consider his application favourably. overdrank -starcraft.man has always been very helpful and patient with the members on the forums, posted several How To's. starcraft.man is a valued member of the Beginners Team/Wiki FG Member. I too support starcraft.man membership to become an Ubuntu member. stlsaint - starcraft.man is a true partaker in helping the ubuntu community. He has not only helped many a people in irc and forums (as i have witnessed myself) but he also takes precious time away from his own self studies to help and support others! (myself included) i am grateful to have encountered startcraft.man when i first came to the ubuntu community for help and support. starcraft.man's many support documents and help he gives in the forums speak for themselves. Everywhere you turn you can see wiki write up that starcraft.man has written not for his own gains but for the further support and advancement of the ubuntu community. I just would like to give a personal thanks to starcraft.man and to say i look forward to working with him in future endeavors. forestpiskie - starcraft appears to be one of those users who is hardwired into ubuntu - he seems to be everywhere at the same time. When I first arrived at the door I found his Installation Guide for Ubuntu along with myriad other well written and thought out posts on support threads - I can't say much more on that- Bodhi has already extolled it's virtues;) suffice it to say that he is probably one of the most worthy of ubuntu membership that I can think of. His recent fast track acceptance into the UBT seems to have given him more to play with and he has become heavily involved in both the wiki and irc help focus groups. I wholeheartedly support him in his quest to gain ubuntu membership and hope that you view his application favourably. swoody - It has been an absolute pleasure knowing and working along side starcraftman. He has truly been the embodiment of everything Ubuntu users should strive to be. He has given back much to the community, and has even taken his time to teach me a few things. His work from wiki pages, to guides, to helping users on IRC, and everything else he does has truly been dedicated and persistent. On top of his hard work, starcraft.man also keeps the community an enjoyable place to be with his wit and humor. I wholeheartedly support starcraft.man in his application for Ubuntu Membership without any reservations.